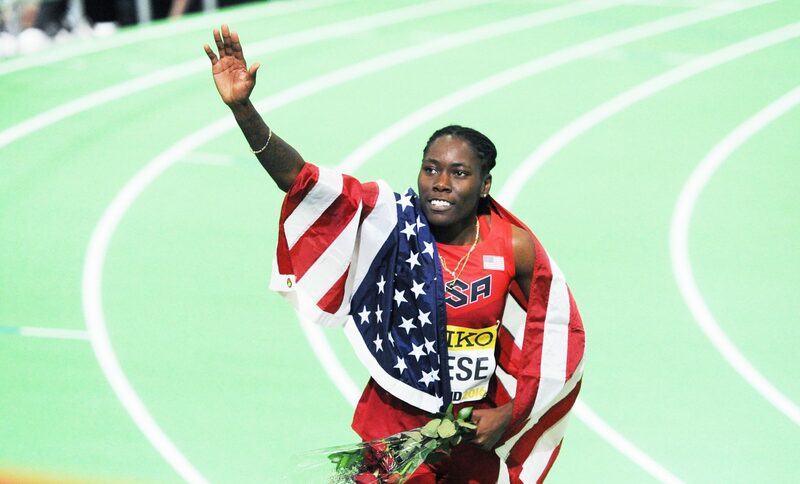 Three US victories on the second day of the IAAF World Indoor Championships delighted the home crowd at the Oregon Convention Center on Friday, as Brittney Reese, Trayvon Bromell and Nia Ali were among the winners. Dedicated UK-based fans staying up to follow the overnight action also had cause for celebration as Lorraine Ugen and Tiffany Porter got GB on the medal table. The women’s long jump competition had looked set to be a top contest and it lived up to expectations as Reese claimed her third world indoor title and sixth world title overall with a superb 7.22m in the final round. That mark, just a single centimetre off the American’s own championship record, saw her soar ahead of Serbia’s European indoor champion Ivana Spanovic, who had led the competition since her 7.00m in the first round and improved to 7.07 in the penultimate round. Britain’s Ugen, who secured her spot for the event by winning the IAAF World Indoor Tour, settled into the competition with three 6.60m-plus leaps but then improved to 6.93m in the fifth round to equal the national indoor record set by Katarina Johnson-Thompson last winter and claim GB’s first medal of Portland 2016. USA’s Janay DeLoach, the 2012 world indoor silver medallist, jumped far in the final round and it looked like she might push Ugen off the podium. The 6.89m was her furthest leap of the competition but not enough to claim a medal. Shara Proctor, who claimed world silver outdoors last summer, had anticipated that a leap of seven metres or more would be needed to get the gold and she was right, but it wasn’t her day and she finished eighth with 6.57m, while the third British athlete in the field – Commonwealth silver medallist Jazmin Sawyers – placed 13th with 6.31m. Having run 6.44 in the 60m heats for a time just five hundredths of a second off Maurice Greene’s world record and then matched that mark in the semi-finals, all eyes were on Jamaica’s Asafa Powell in the day’s final event. But the former 100m world record-holder will have to wait to claim his first individual world title as he failed to again demonstrate the sort of form that saw him move to fifth on the world all-time list earlier on in the day. Clocking 6.50, Powell had to settle for silver as USA’s 20-year-old Bromell blasted out of the blocks and over the line to record a 6.47 PB and go two better than his world outdoor bronze claimed in Beijing last summer. Although Bromell’s win was clear, the rest of the field was subjected to a tense wait while the minor medallists were determined, silver going to Powell and bronze to Ramon Gittens thanks to his 6.51 Barbados indoor record, with just 0.09 separating the winner from the eighth-placer to equal 2014 in being the closest world indoor 60m final in history. James Dasaolu, who had an early exit from the world outdoor championships last summer, also had his competition in Portland cut short as he was disqualified from his semi-final for a false start. It was a second disqualification this season for the British champion, who has a PB of 6.47 from 2014 and clocked 6.53 to take the UK title in Sheffield, after a false start in Berlin last month. Clocking 6.61 despite a niggle, Andrew Robertson, who finished behind Dasaolu at the British trials with a 6.54 PB, finished fifth in his semi-final. With three finalists in the women’s 60m hurdles, an American winner had been expected and it was defending champion Nia Ali who secured success. Clocking 7.81, she led a USA 1-2, beating Brianna Rollins by 0.01, with Porter claiming GB’s second medal of the championships as she clocked 7.90 to claim her third consecutive world indoor medal. 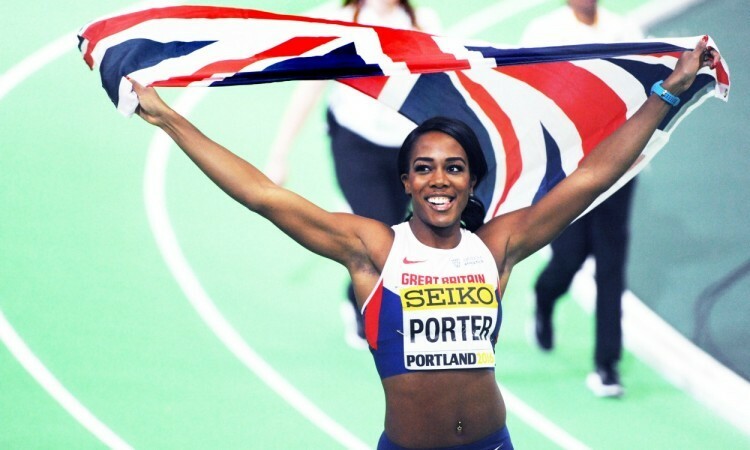 Porter’s team-mate Serita Solomon placed seventh in 8.29, ahead of American Keni Harrison. The pentathlon ended with an emotional victory for Canada’s Brianne Theisen-Eaton. Silver medallist at Sopot in 2014 as well as outdoors in the heptathlon in 2013 and 2015, the Commonwealth heptathlon champion ran the race of her life in the 800m and it paid off as the 27-year-old did enough to move from third to first and pip Ukraine’s Anastasiya Mokhnyuk to the title. Theisen-Eaton needed to run more than 10 seconds quicker than Mokhnyuk in the final event to overtake the leader and with 2:09.99 to Mokhnyuk’s 2:23.19, the Canadian achieved a 4881-point North American record to secure the win by 34 points. Mokhnyuk’s team-mate Alina Fodorova bagged bronze with 4770 points, while Britain’s Morgan Lake, who had been targeting the world under-20 record, again came close to the official record mark of 4535 set by Carolina Kluft with her tally of 4499 points. First to congratulate Theisen-Eaton was her husband Ashton Eaton, who leads the heptathlon competition after four events with 3564 points ahead of Grenada’s Kurt Felix with 3501 points. Over in the shot put, New Zealand’s Tom Walsh – a bronze medal winner in Sopot two years ago – got the gold in style this time around, improving the Oceanian record three times during the course of the competition and eventually throwing a world-leading 21.78m in the final round to secure victory. Recording 21.60m in the second round, that would have been enough for the win as his rivals couldn’t better 21 metres, but he improved to 21.64m in the fourth round before his winning mark in the last. Romania’s Andrei Gag had three fouls but 20.89m from his first attempt secured him the silver ahead of Croatia’s European under-23 champion Filip Mihaljevic’s 20.87m PB for bronze. Britain’s Chris O’Hare ran a well-judged 1500m to clock 3:41.09 after easing off as he approached the line, securing a spot in the final behind defending champion Ayanleh Souleiman’s 3:41.04. UK champion Charlie Grice won’t join his GB team-mate in the final as his 3:49.03 for fifth in a first heat won by USA’s Matt Centrowitz in 3:47.15 wasn’t enough to see him through. Kemi Adekoya improved her own Asian 400m indoor record to go quickest in the semi-finals with 51.47, while US champion and fastest in the field, Quanera Hayes, her US team-mate Ashley Spencer and Jamaica’s Stephenie Ann McPherson also secured their spots in Saturday’s final. Bralon Taplin of Grenada, the world No.1, clocked 45.38 to dominate the first semi-final in the men’s event, while Czech Republic’s defending champion Pavel Maslak got the win in the second, clocking 45.71 for a time matched by runner-up Abdalelah Haroun of Qatar.